Welcome to the relaunched of 7 days in phones as Keitai (the Japanese for phone culture) - where instead of telling you what's already happened, we'll be bringing you weekly tips to get the most out of your phone as well as trawling the archives of phone-related nonsense and checking in with our favourite cyborg unicorn. If I could give you just one tip, it's this: if your battery has 'suddenly' become rubbish, it's not usually your phone that's killing it, it's an app. Yes, it's great that your new phone can go brighter than the sun (as that's really useful outdoors) but most of the time you don't need all those lumens. While most of you will have tagged auto-brightness already, letting your phone react to the ambient conditions, you can take it one step further. Many phones allow you to lower the intensity of the auto brightness, so when outside and in shade have a play with this until you get to a level that's comfortable for you. Oh, and make sure your screen lock is turned down to the minimum time. Chances are you'll mostly only glance at your phone anyway. If you've not found any rogue apps in your system, then it doesn't mean there aren't any programs in there trying to nab your precious power. Go into commonly used apps and have a look at their menus, as there's often an option to alter the frequency of syncing or disable altogether. While the notion that turning off Wi-Fi and Bluetooth is often touted as a way of saving battery, in reality it's effect is minimal and irritating when you actually want to use your fancy phone. However, GPS is a bit of a killer still, so it's best to go into the Location Settings on the phone and tweak it to a level you're comfortable with. Things like Google Maps work better with a high degree of accuracy, and don't nab too much power, but some other random apps can spend time tracking you for no real reason – it's usually mot sinister, just badly written code. As the council chamber dispersed, Winston sat down noisily onto the floor, his ability at controlling the mechanical limbs still not quite where he wanted it to be. The Nokia charger lay in front of him, perplexing his every sense. It wasn't one of the newer ones, but a plug with a fat, round tip on the end – although that wasn't what caused his unease. It was the fact the wire was bound with the Velcro perfectly formed around the loops. It was virgin, never touched, never ripped apart. Could this really be it? Really be the link to the phone that had haunted his dreams, the thing that had caused him to wake at night screaming only to find he'd had to go and find new sheets? He reached out gingerly to touch it, his hoof quaking with the anticipation (and the misfiring rotors in his joint) – before the floor caved in beneath his heavy body. The whole arena fell away, and Winston was thrown downwards. He opened his eyes slowly, looking up a the fading light above. He coughed, taking in his new surroundings. Were those fire torches on the wall? What did those strange markings mean? Without a second's hesitation he raced off after it. His time was coming. He was close to something… he could feel it. He just didn't know what. I was racking my brains trying to work out which video to bring you this week – there have been some stellar efforts of late, highlighting the pure madness of press launches. That was it… Qualcomm's 2013 press conference at CES. Where it hire actors that went so over the top it made you wonder what humans really were. Where Steve Ballmer skipped across the stage. Where Desmond Tutu and a Rolls Royce both turned up. Just watch. It really happened, I promise. What's this? A Samsung Giorgio Armani phone that's every bit as fashionable as it is functional? Look at them. So in love. There's a random lipstick mark on the top of the frame. She's so in love. Oh, and the phone is huge in picture one, and tiny in picture two. Either that or one of those men has freakishly small hands. You know how people are always trying to put a phone into a watch? They're not trying hard enough. The Zihotch Watch (Hey, that rhymes!) asks you to poke the numbers 117 in the rotary dial, and a Japanese voice will tell the time. Dial the wrong number and you'll be told the number you've tried is not in service (apparently… I don't speak Japanese). If my 'time it takes stuff to come from Japan to the rest of the world' algorithm is correct, this 2007 invention is about to hit out shelves any day now. 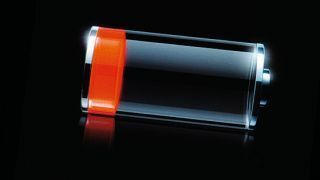 Will smartphone batteries EVER be any good? Naaaah.